Starting this week, we will be posting member artwork on the blog. If would like to have your work featured, please contact Mary Ingels. 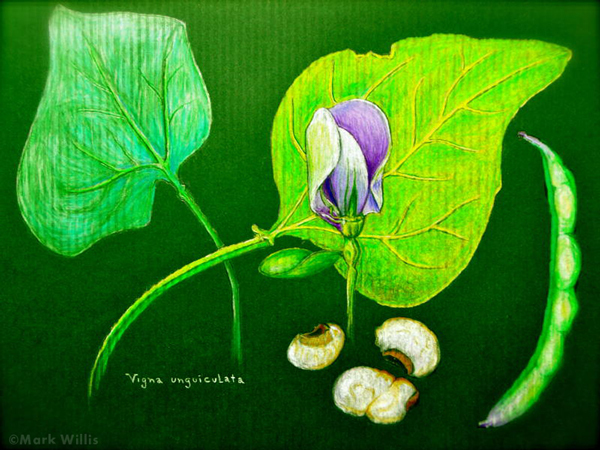 Attached, please see a recent colored pencil sketch I did of black-eyed peas which are a “good luck” tradition around New Year’s time in the South. (After leaving Naperville in 2007 to retire in Athens, GA, I have learned a few new traditions in the south.) While the local red clay soil is not as kind to northern plants, there are many local plants which are intriguing to cultivate in this area. I do miss the Arboretum’s botanical classes, but can vicariously enjoy the guild’s activities. Athens does have a State botanical gardens (connected to U of GA), which provides a great source of inspiration to do artwork! This entry was posted in Member Artwork, Member News and tagged Member Artwork. Bookmark the permalink.